Hendrik Snow is admitted to practice law in Alabama in all state courts and in the federal courts for the Southern and Middle Districts of Alabama. 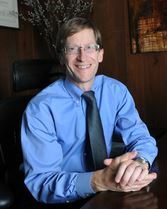 He has been a member in good standing of the Alabama State Bar and in active practice since 2004. Hendrik attended the Cumberland Law School where he earned his law degree in 2004 with distinction for his participation in the moot court program. Before attending law school, he earned a Master of Science degree in Geography from the University of Alabama in 2001. For his undergraduate studies, he attended Middlebury College where he earned a B.A. in Environmental Studies in 1991. Hendrik has lived in Mobile since 2004. He is married to Amy Hunter and is fully occupied away from the office with raising their twin boys and younger daughter. Hendrik has served on the Vestry of All Saints Episcopal Church. He is an active member of the board of the Alabama Coastal Heritage Trust, a non-profit charitable organization dedicated to preserving the habitat and natural features of Alabama’s coast. He also dedicates his time to pro-bono legal help with the South Alabama Volunteer Lawyers Program.